Eric's Review - First... Wow. Just wow. This is the third planeswalker to have two +1 abilities AND the only others were printed in Standard about 4 years ago (Nissa and Elspeth, Knight-Errant). 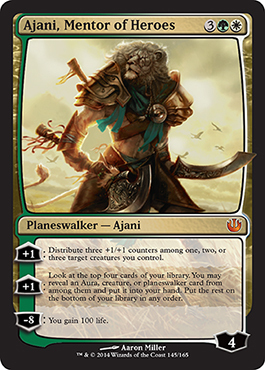 Costing five mana, Ajani 4.0 comes in and a decent 4 loyalty with three awesome abilities. He puts out more counters than Ajani 3.0 (Caller of the Pride) and he searches for auras, creatures, or planeswalkers. Yes, other planeswalkers can be found with Ajani. And 100 life is 100 life. You can survive a lot with that ability. This Ajani is a major powerhouse and expect him to stay high in price for a while, or at least until we see tournaments where the Top 8 don't run him. Bottom Line: This is a great card. He fits in Standard, definitely in Limited, EDH, and I'd be willing to bet he'd be strong in Modern too. Devin's Review - This card is maybe a standard all-star. It's first +1 (yes first plus one) let you build a monster or give your team a slight boost. 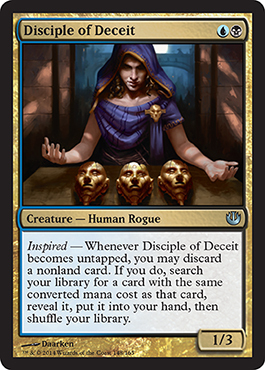 Then we go to the second +1, Which lets you dig deep into your library and get real card advantage in G/W. Finally there is this guys ultimate, which lets you laugh as your opponent most likely decides to concede because you just gained 100 life. Though this card does have some weaknesses. In an empty board all he can do is give you some card advantage if you are lucky, he also has the huge disadvantage of costing 5 mana. Overall he will try to see some play in standard, will be amazing in limited, and be loved by all EDH players. Eric's Review - First of all, the cost for this guy is insane. The only way to ditch him is exile, and he returns creatures to your hand when they die. Plue he's a 5/4. 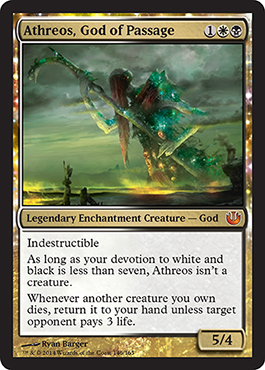 Sure seven devotion could be a pain to get to, but by turn 4, he should be a creature (think white weenies with Precinct Captain turn two and something else turn one with Atheros as the turn three). This is just insane. 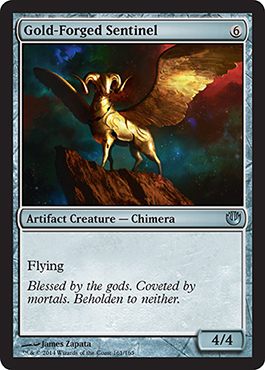 Devin's Review - I remember when Mark Rosewater made the comment that when designing the gods he wanted to give them an ability that wouldn't be completely playable if on a regular enchantment card. Well he has proved himself wrong and this card is one of the reasons. Being able to recur creatures for now price (from you) after this is on the field is fantastic, this is good even with giving you opponent the chance to prevent it with 3 life. This card will be a standard all-star who will wreck the format and make already good decks better and decks that weren't playable before decks to be reckoned with. This card will be loved by the EDH players and i can't wait to build an EDH deck around him. Eric's Review - For two mana, giving creatures +2/+0, vigilance and first strike is pretty powerful, but being able to essentially copy the spell for two mana each time, we'll it's like tapping an Isochron Scepter multiple times a turn (bad metaphor since Scepter is for instants, but you get the idea). 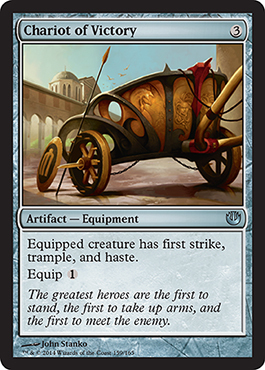 Bottom Line: Any heroic deck running red and white should probably be using this. Devin's Review - Not that bad though not close to the best strive card even at uncommon, though it can help push you two the super aggressive R/W heroes deck in limited. Eric's Review - I see this being far more of an EDH card than anything else. It essentially gets rid of things you don't need and trades them for things you do. 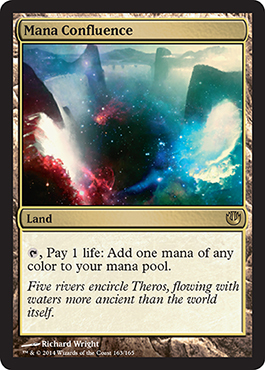 Bottom Line: Standard could put this to use, maybe, but EDH would benefit more. Devin's Review - I love this card, I can't wait to transmute anything in my hand into another card in my deck. Though this may be good some in limited this card will see no standard play. 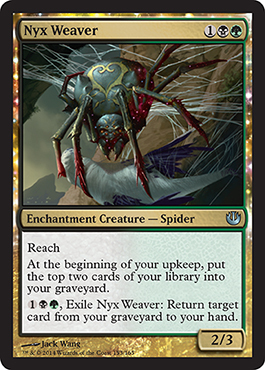 Where this card will do best in is EDH were a repeatable tutor effect isn't that bad. Bottom Line: Limited might see this used, not sure about Standard. This should show up in Blue/Green EDH decks though, I think. Devin's Review - this card is alright though there is one word on this card that make it playable at all, Flash. This card is alright in limited though i don't think it will see much play. 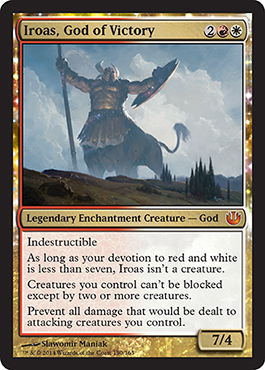 Eric's Review - Iroas is a pretty powerful god, especially coming in at four mana. Creatures you attack with must be blocked by two or more creatures and they can't be dealt damage when they attack. This is really powerful. 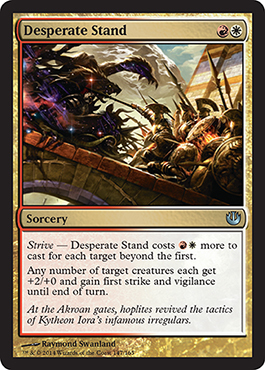 Devin's Review - So boror aggro may now be deck when all your creatures can't be blocked except by 2 or more creatures and you don't care how many creatures block or what you attack into when none of your creature can die because Iroas, God of (your) Victory says so. Though this may be great in standard he will be a general to reckon with in EDH. 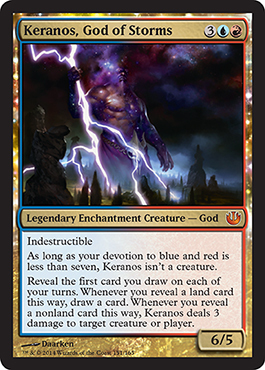 Eric's Review - Keranos is pretty powerful, however I don't see him doing well in Standard. You reveal cards and you can draw additional cards if the first card you draw is land and nonland cards deal three damage to a creature or player. Devin's Review - This card is amazing, and i feel his perfect fit is into standard American Control that i feel will get more play with the release of the U/R scry land. 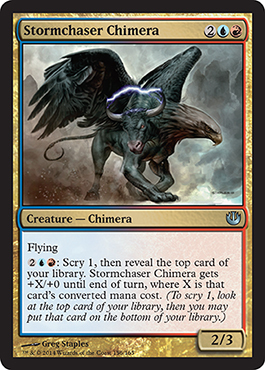 When this card comes to EDH i have no idea were to place him as most Izzet decks are really spell heavy and this card does not help in there fun. 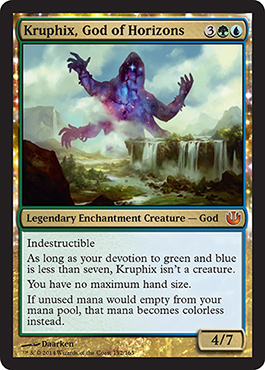 Eric's Review - Kruphix boosts your mana reserves so that your mana pool does not empty and instead hangs around and becomes colorless. It's not the best (Omnath is better), but in Standard, this is a major boost, especially if you have mana and nothing ig to play. Bottom Line: EDH for sure, but I'm not sure this will really go anywhere in Standard. Devin's Review - I love this card for so many reason. Mostly though for his second ability and what you can do with that in standard with all the other crazy simic stuff in the format (though i will go deeper on this subject in a few weeks). When it comes to EDH i see no reason why you wouldn't replace him with Omnath just so you can get the extra color that also happens to be the best color in EDH. Eric's Review - Well, here we go with more B/G graveyard things in Standard. Definitely not a bad card, especially for that deck. 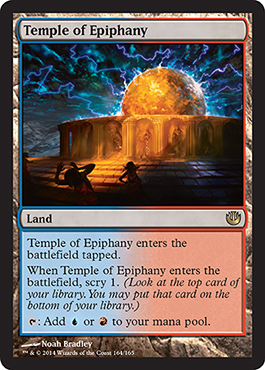 Devin's Review - This card has one home in a G/B dredge deck in EDH. Being able to mill two each turn without sacrificing your draw is amazing. 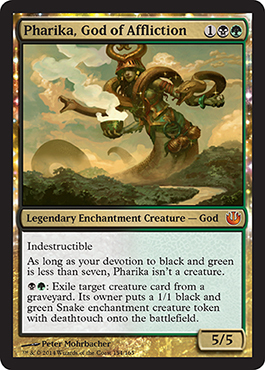 Eric's Review - Like the other gods in this set, Pharika is powerful as well. If you have cards in your graveyard and mana to spare, you can exile a creature card and give yourself a deathtouch snake to remove a threat. If an opponent wants a card out of their graveyard, exile it in response. Sure they'll get a 1/1 deathtouch snake, but Pharika can't be destroyed and therefore negates the deathtouch. Bottom Line: Powerful and definitely a card to show up across a variety of formats. Devin's Review - Probably the worst god in this set, though that is not to say that it is bad, i feel this card shines in some obscure snake EDH deck as your snakey goddess to rule your army of snakes. Eric's Review - Well this is quite interesting. 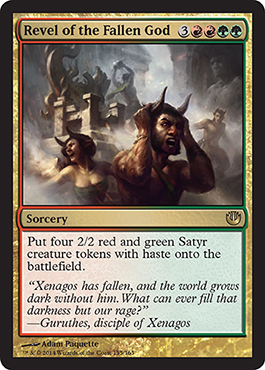 It puts out a lot of Satyrs, but I'm not sure the cost is worth it (or even attainable) in a fast-paced Standard. As long as there are decks capable of ending the game on turn five or six, this card has no place in Standard. Bottom Line: EDH maybe, Limited definitely. Not much else where this could fit. Devin's Review - 6 mana for 8 toughness all of it with haste isn't bad, but for the colors it is in it is too slow to shine in any real format besides sealed or possibly EDH. 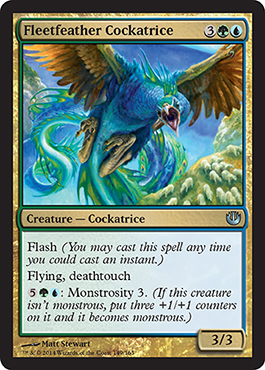 Eric's Review - A flying creature that can boost through scry. It's not bad, but you run the risk of not giving it any boost. Devin's Review - This card is crazy and that is not a bad thing. Being able to boost this creature with a slight gamble on how much it was worth just seems fun. I may throw this into some weird EDH deck. Eric's Review - I actually like this. It gains you life for enchantments (it's cheap too), and you can also pay life to make opponents lose life. Any multiplayer game could be won with this card. As long as you have more than one opponent (such as in EDH or Two-Headed Giant), then losing one life makes a total of 2 or more life lost amongst opponents. 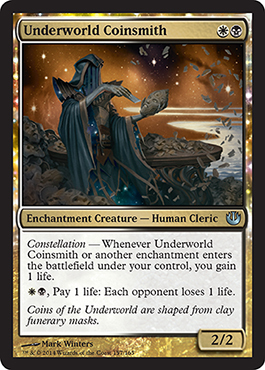 Bottom Line: EDH is where this fits, but if you have lots of life and mana, you could drop your opponent down a bit in Standard. You also could make this work in Two-Headed Giant. Devin's Review - this is an odd bear, that i can't really comprehend. 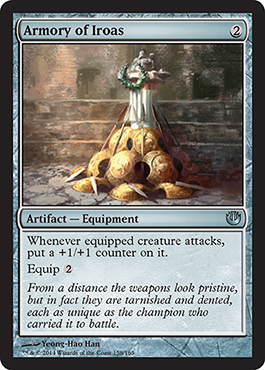 Eric's Review - Wow, a boosting artifact that gives a creature more counters. I like it. Devin's Review - I really like this card though i think that it is only good for limited. Eric's Review - Not bad either, but not for Standard based on the cost. Bottom Line: EDH and Limited will definitely put this to good use. Devin's Review - This card will be amazing in limited, though that is about it. Eric's Review - Kind of powerful, and a bit like Rubinia Soulsinger. Much too costly though. 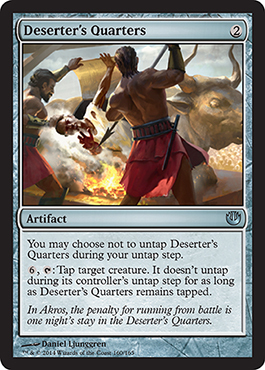 Bottom Line: EDH is probably where this would go, although I could see control decks potentially using this. Devin's Review -This card costs to much for it to really do anything in any format. Devin's Review - 6 mana for a 4/4 flier is too much. Eric's Review - This is a pretty powerful card. Sure it costs three mana, but it boosts all creatures of a certain color (so it's not as good as Spear of Heliod, but it'd pretty good). Bottom Line: Maybe Standard could use this, maybe mono colored EDH decks could use this. 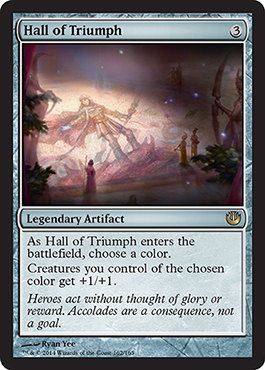 Devin's Review - A colorless anthem is broken and it will be amazing in standard. Being able to let the elementals in MUD live is amazing. Eric's Review - A functional reprint of City of Brass is awesome, especially in Standard when you may not see the particular color you want. Bottom Line: This is a card for everyone in any format. Devin's Review - This is a lot of mana consistency that will be amazing in standard, legacy, and even vintage. Eric's Review - About time we get a Blue/Red scry land. It was needed. Bottom Line: It's a scry land! Eric's Review - About time we get a Black/Green scry land. It was needed.